The combined chambers of commerce met again for their popular monthly networking meeting. The venue this time was the 17th floor ballroom of the Hilton hotel in Pattaya offering spectacular views across the bay. 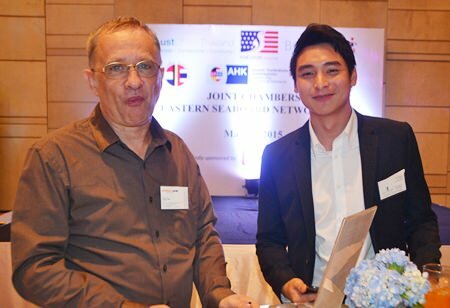 The event was held on Friday the 15th of May, and on this occasion was hosted by the American Chamber (AMCHAM). 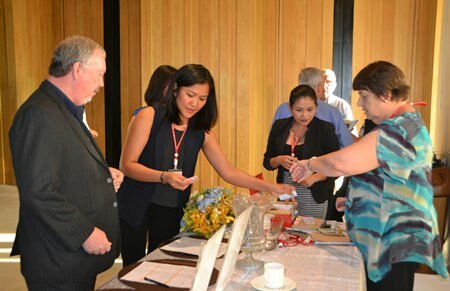 As the chambers now combine their efforts, representatives and members from the German, British, Belu-Thai, Australian & South African chambers were present. Familiar faces at the chamber events, George Strampp (left), managing partner of Automotive Manufacturing Solutions, and David Nardone (right), president and CEO of Hemaraj Land and Development. 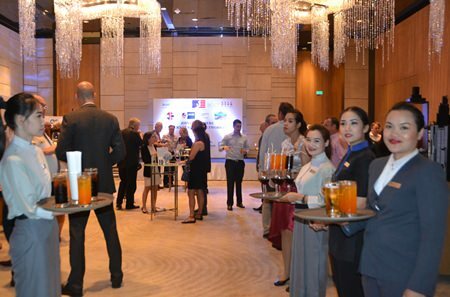 The attentive staff at the Hilton ensured that the ice cold beers and wines were served to those attending, along with an array of tasty snacks. Networking has always been an integral part of expanding local business whether it’s done on the golf course, over lunch, or in an organized get together. The combined chamber allows local business owners and management to interact with each other and be introduced to those also providing services, from graphic design, accounting, marketing, property, oil & gas services, automotive, etc. 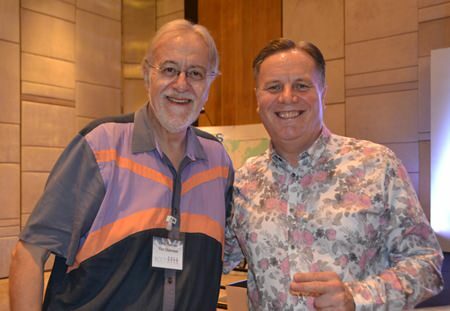 Robert Vogel, consultant with EFAFLEX chats with Dan Narapruet, sales manager for the Royal Cliff Hotels Group. In addition to the Hilton being a sponsor, they were joined by Wall Street English, a company specializing in English language courses with native speakers, either on a one to one, classroom, or company setup. 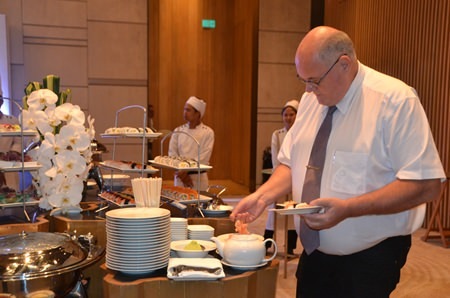 Also PCS: Property Care Services, who have worked in Thailand for decades and provide services such as cleaning, catering, security, pest management, gardening, inventory and audit, building maintenance and cannon washroom hygiene. 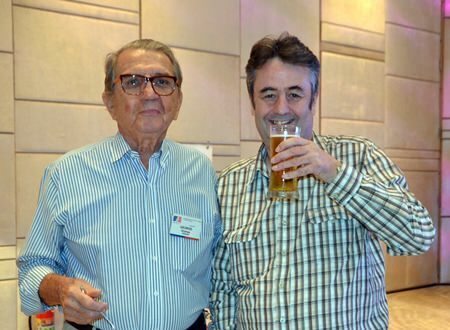 The next combined chamber will follow in June and details of which will be published in the Pattaya Mail beforehand. Guests register for the networking evening. 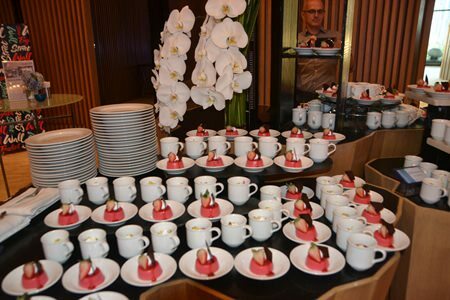 Desserts a-plenty for those with a sweet tooth. 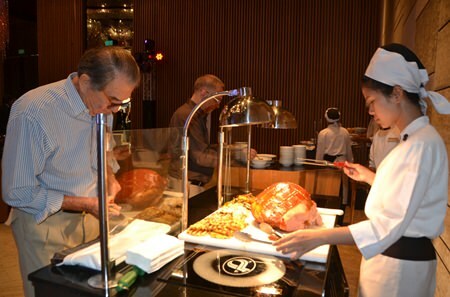 Succulent baked ham was one of the dishes presented by the Hilton Pattaya. A little sashimi for those who wanted Japanese food. The elegantly attired staff at the Hilton, always at the ready to serve the networkers. BCCT Vice Chairman Chris Thatcher joins an ever colourful Simon Matthews from Manpower Group. 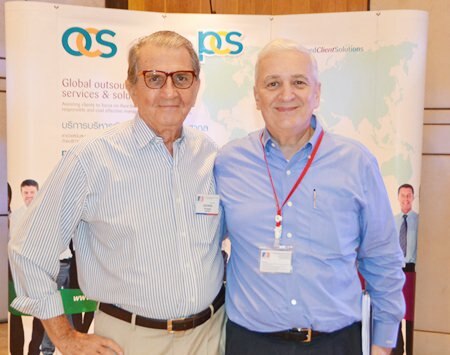 George Strampp (left), managing partner of Automotive Manufacturing Solutions, shares a moment with Mark Butters, director of RSM Advisory Thailand Ltd.